Cats vs Dogs What should you get? Both! What should you get? Both! Cats vs dogs, the old debate. I was always one of those that answered - Both! They both have their unique set of great qualities and they are not necessarily incompatible. You can have both dogs and cats living under the same roof. 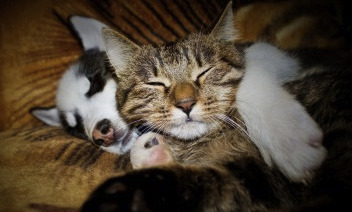 Canines and felines are so different that we think they won't be able to get along in the same household. This is not always true. Under the right circumstances and with proper training both species can live and enjoy each others company. There are millions of cats and dogs living together in the world. I grew up with many of them around and witnessed love and hate stories between them. As a trainer, now I understand that the balance in their relationship has a lot to do with their individual histories, as well as how we introduce them to each other. Constant supervision: When introducing these two different species make sure they are supervised at all times until they are completely comfortable around each other. Animals can start a fight and get hurt. This will set you back a lot because now they have a bad association about each other. It will truly be cats vs dogs! Is your dog or cat friendly towards the other species in general? What will you do if one of the animals attacks the other? Will the animals be restrained when introduced? How? Does each animal have a safe place inside the house? Knowledge is power! Learn the differences between dogs and cats. These can help you prepare and deal with each species specific problems. Be patient: the friendship process might take a while. If you do it slowly, giving the cat and dog plenty of time to feel good and comfortable about each other, you will succeed! Instead of cats vs dogs wit will be Dogs AND cats! The easiest way to get a cat and a dog to be best friends is to introduce them when they are both young (puppy and kitten). They are both developing and learning from their environment, so they will easily learn each others body language and personalities. If this is your case, make sure you supervise them the first few times and encourage polite or playful interactions by playing and giving them treats. Based on my own experience I can tell you that an easy way to introduce dogs and cats is if at least one of them is very young (puppy or a kitten). My first dog, Chip, made friends with a kitten we got, they were inseparable! When my dad took the dog for a walk, the kitten would go along and walk in and out between Chip's leg. It was adorable! That is just anecdotal though but there is research supporting this story! A group in Israel interviewed, videotaped and analyzed 200 families with cats and dogs. They found that if the animals are introduce when they are young there is a high chance of success. The study suggests that dogs be 6 months old or younger and cats less than a year. No matter how easy it can be, make sure the animals are supervised initially. Offer plenty of rewards as food treats, toys, attention or playtime when the animals interact properly with each other (no growling, biting, scratching or hissing). Previous obedience training is always a must! If you notice that one of the animals is really uncomfortable remove it from the situation. Try again later making the interactions short and full of rewards. Warning: If you have an adult dog that likes to chase anything that moves, getting a kitten might not be the best idea. The dog might see it as prey and the story will only have a sad ending. Your dog must be gentle. Use obedience training often, this will give you a chance to stop any rough interaction. If both your pets are adults. Then you will need more patience and training. Read this article with detail instructions on how to properly introduce Dogs and Cats and have them get along. Cats vs dogs fight solutions. Are your dog and cat fighting? don't know what to do to stop it? If your pets are already fighting, there is still hope. A good solution is to train your dog not to bother the cat (or vice versa) and to teach your cat to "love" the hound! It requires a lot of patience and practice but you can turn the situation around. Click here for step-by-step instructions. Does your hound chase cats? This is dangerous for both your dog (running away) and the cat! Learn here why do dogs chase cats and how to stop it!